Is this thing on? I can't believe I haven't written a blog post since December 2016! I've had tons of ideas in my head over the last year, but just haven't found the time to sit down and write them, so the One Room Challenge is the perfect time to get back in the groove of sharing project details! Although I got too busy and missed last week's first blog post, I'm pretty sure I can catch up this week! 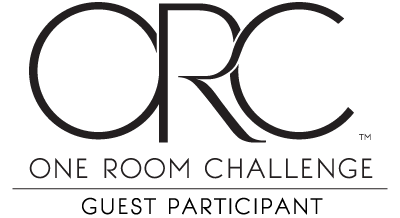 This will be my fifth time doing the One Room Challenge as a guest participant, and I love it because it's the only thing that forces me to actually focus on projects around my house. During my first challenge we tackled a laundry room renovation (you can see the reveal here). and for my fourth challenge we converted an unused bedroom into our guest bedroom (reveal here). For my fifth challenge I plan to convert our old guest bedroom into a home office for my husband who has started working from home for part of the week. I'm happy to see this room changed because it's totally not my style anymore, and it has just become a hodgepodge of our old furniture. Here is what it looks like currently. We sold the headboard a long time ago when I had originally planned to redo the room, but that was as far as I got with my design, ha! This is the direction that I'm envisioning, but if I've learned anything from these challenges, it's that my design will almost certainly change by the time this is over. I was originally going to keep the walls white, but I have these green linen curtains from Anthropologie that I originally bought for the room (four years ago! ), and they've been sitting in the closet ever since. I really love the way they look against Farrow and Ball's Pale Powder, so I'm going to try some samples on the wall to see if this is the direction I want to go. This room gets very little light because of the small window and a tree next door that blocks almost all of the natural light (and why I originally had to move my office out of this room two years ago), so I want to keep the paint color light and bright. If anyone knows the designer for this beautiful room, please let me know! I can only find it linked to Tumblr accounts or not credited on other blogs! However, we're not planning to be in this house much longer, so I decided it's better to put money into something that we can take with us to our next house. These two shelves will hold my samples and design books/magazines, and the sleeper sofa will keep this room functional as a guest bedroom for the occasional time that we need two guest rooms at the same time. I'll get more into the specifics of the design plan in my next post. This weekend I plan to make all of the big purchases, try out paint samples, and read all about the other participant's spaces. Make sure to stop by this week to check them out!